I was born in Brooklyn but moved, along with the rest of my family's belongings, to South Florida at the age of four. As a grade-schooler I earned pocket money drawing funny pictures of my classmates and teachers. Upon graduating from Florida Atlantic University with a B.A. in English, I was recruited into my brother's rock band to play the bass guitar. After seven years of playing in night clubs and lounges I accepted an honorable discharge and began the relatively "secure" career of a freelance cartoonist. 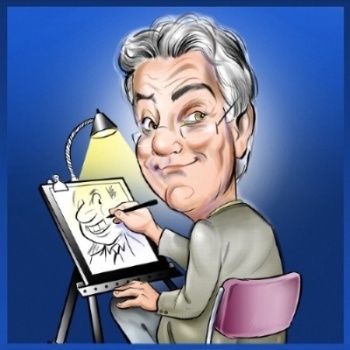 My business has a performance component; doing caricatures from life at parties and special events (I've done around 75,000 caricatures, no end in sight) and a studio component; humorous illustration for publications and advertising. Some of the publications my work has appeared in include Mutual Funds Magazine, the Miami Herald, Jazziz, the Sun-Sentinel and the Boca Raton News. My cartoon strip "It's the Humidity" ran weekly for two years in the opinion page of the Sun-Sentinel, Florida's largest daily newspaper. 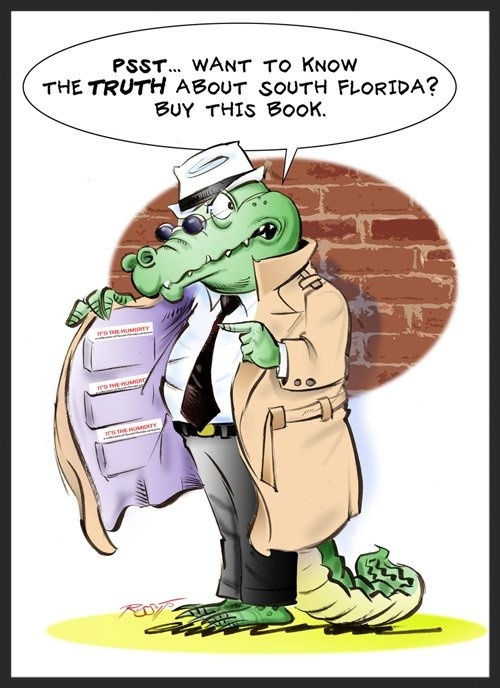 Click on the Gator to buy my cartoon book "It's the Humidity"